Oh my, you crack me up! I have a laundry rule of my own, everytime I do the washing we each have to throw away/give away three things. I don't care if they are ratty or not, I hate doing laundry and seeing 3 things from each of us in the trash (or donation box) makes me feel better about that horrible job. well, now, that is just the best bag ever. ever. i will be stealing this idea straightaway. genius!! Have a lovely, lovely trip!!! I couldn't help but laugh out loud at that last comment. I can (just) deal with the fact that my blokey doesn't put things in the wash basket, but leaves them by the bed instead. What really annoys me is when he takes his socks of in his studio and stuffs them down the back of the desk, or his amps. Cleaning the studio is his job, but every few months I give it a good clean and find masses of socks. To make it worse he doesn't care if his socks match, he also wears mine a lot, so I always have a carrier bag of odd socks waiting for their partner to surface. I absolutely adore the bag. I'll never be able to throw any scrap away again. Wow. That's a lovely recycled creation. Wonder if my trash pile could result in such a pretty thing. I've been thinking about that since I saw the beginnings of this on flickr. Speaking of trash - maybe your husband would catch the drift if you turn his improperly discarded undies into a similar bag. Ew, wait that's gross, and I'm doubting he wears Oilily inspired undies. I just took a look at my hubby's which are tossed next to the shower doors every gosh.darn. morning. Nothing pretty could be made out of those either. Darn. That purse is amazing! I love that it is made from fabric scraps. I've seen some fabric (by the yard) on Ebay that claims to be Oilily - not sure if is legit, or what the sellers' source is. Reading this makes me feel bad, because I'm the dirty monkey in our house. I have a pile of clothes on a chair in our bedroom, referred to as the 'clothes mountain' by my lovely husband. It is a pile, which is neither dirty nor clean, so has no proper home, but in the end is start on by cats and is then dirty. I'm a bad dirty girl! But anyhow, have a great weekend, and more lovely bags, because this one, is just divine!! AHHH! Lucky Mickey Mouse pants! Hilarious. I love the bag. Also, I bought my first copy of Cotton Time and I'm totally 100% hooked. Not that I've made anything yet, just that I neeeeeed all of it around me, all the time. It'll go great with the clothing draped all over my house, new and old and clean and dirty. 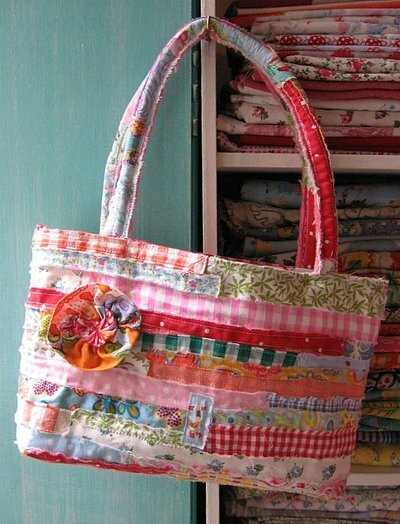 This is so darned cute I'm tempted to drag out my scrap bag & make one of my own. Just darling. oh, i"m SO laughing at all of this, as usual Lyn. You're such a hoot. I think you've inspired me to start throwing away some 'not so pretty' things laying around my own house...just feet away from the laundry basket, but not IN the laundry basket. Oh my gosh, and that bag!! I really really love it and it's 'raw' edges. So great. Have a wonderful time away from home! Why exactly do they make man-sized micky mouse pants and how do they become lucky? I'll be wavin' back to you Friday night. Fantastic bag! And the whole laundry thing is hilarious! I love Roald Dhal...have a good trip! beautiful, lyn. love it. and i'll be waving back at you. Hey, my husband knows not how to use a hamper either. Solidarity! So so lovely! I gasped with delight when I saw your photo! 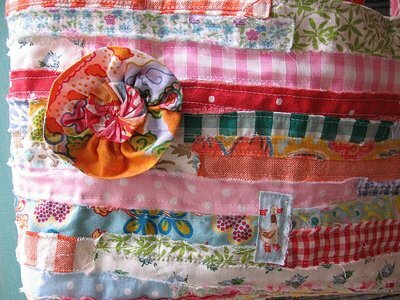 And your fabric stash is so perfect and pretty - I can't imagine you throw any of it away! Have a wonderful weekend! Oh MC Lady! this is soooooooooo divine. I AM going to try and make one of these AND I AM going to start throwing out all the male underpants/socks that live on the bedroom floor ( when the laundry basket is 3 ft away in the bathroom)You are a wise and wonderful woman! Haha! Adore the bag - it's beauooootiful, and yes a bit of patch-up stitching will only add to it's loveliness. What is it with the male aversion to laundray baskets? I swear, my partner just throws his clothes down wherever he likes creating nice little piles for me to pick up. Sometimes he even puts his clothes on the floor next to the laundry basket!?!?! - there is no lid on ours, it is an open basket, so why he can't throw them a couple of centimetres to the left or right I have absolutely no idea. I feel your pain, truly I do. My husband manages to put his football kit in the washing machine but leaves it there for days festering until I come along with armfuls of washing only to find his stinky kit in there - so annoying. Love your new bag and hope you have a fab weekend. Lovely bag!, yes i like to cut up all my old clothes for scraps in fact i have been known to cut up my new ones too:0. Great bag! How about a tutorial? Hope you have a good weekend despite the weather. That bag is oh so pretty! Great bag! - and I share your oppinion: stitches only contributes to "the texture" - that´s what I do a lot when making collages (paper). And I´ll join the chorous of girls asking for a tutorial..
Love, love, love that bag. Just wouldn't be the same made out of greying and holey pants. Oh that bag is lovely, you have completely inspired me to make good use of my scraps. I think I would love a whole quilt like that, it looks so right. Now I'm very curious, where are you off to? It looks lovely, have a great time. My guy doesn't grasp the hamper for socks either. I retaliate by leaving all laundered socks in a basket. He hates that. We're headed off to the family house north of us on the river this weekend, and for the first time in WEEKS it is not supposed ot rain. It will be cool, but sunny. There is a local Applefestival near there with 300 crafty vendors that I have great plans to head off to visit with my magpie. hee hee. This bag is divine. Such a contrast to smelly men's underwear. My boyfriend has now overtaken our bedroom floor with piles of clothes, the spare room is his dressing and drying room and the dining room has jackets, ties and who knows what else draped over every chair. Of course it goes without saying the trail of socks and undies on the bathroom floor. You are definitely not alone. it's a lovely recycled creation ! i skeep the idea for my scraps ! no need to comment on the bag because it is JUST that lovely!...but the socks made me laugh out loud! i would do the exact same thing! haha. that is so wonderful, and it does make cleaning a little easier, right?! Lynn, I loved your blog before today. I've experienced heart palpitations over some of your wee creatures (softies, kitties, and kids) and the ways you find to present them, but after today's post, I am completely in love! The bag, the underwear/laundry thing, the cutting up of old beloved dresses--brava! I'll be waving, and blowing kisses too, from the US East Coast. I guess I am a really lucky women; my beloved one never leaves his dirty laundry somewhere and is even able to do his own laundry... and does it! Wonderful bag! It is perfect to add some colour to this grey day. It is the Oilily-outlet in Alkmaar/Netherlands. They have some of the fabrics there, too, but you never know, if there is something interesting. Around the corner there is actually the shop of Room Seven, the "pastel daughter" of Oilily. Very nice fabrics, too and great quality cotton. Thanks for the post and your great blog! Okay, Lyn, I'll be waving too! All the way from California! Have a lovely weekend- love, love, love the purse. Love the image of you going around throwing away lucky underpants! You're so....cheeky! Oh man, that was funny. My husband has the same problem. Our house is quite small, and he'll just change his clothes wherever he happens to be and leaves the dirty ones where they fall. More than once have I tripped over a pair of tighty-whitey's in the living room. Love the bag, as usual. All your creations just bring out the smiles. what a gorgeous bag, i feel a making session coming on. and is that a photo of polperro or s a littlre futher west than that? Anyway, the weekend sounds lovely -- the scrabble, the Blyton and Dahl. All of it, really. I will be spending my weekend trying to figure out how you made that lovely bag and searching madly for Oilily sources so I can receive the promised licking. I'm in love with the bag and the story about your husband cracked me up! Have fun this weekend! Did you sew any lining for the bag? I am definitely going to make one of these as I have heaps and heaps of fabric (more than my own clothes) lying around and too sad to just throw them away. I mean this in the best way (just in case you're a Project Runway fan and you know who Angela might be)...I love the fleurchon. The bag is quite cute too. OK, I see I'm a little late in commenting. I'ts obvious everyone LOVES this bag! I am killing myself laughing over the *Lucky Mickey Mouse pants*!!! The bag is fabulous. I love the colours, the textures and the fact it is made out of scraps. A truly brilliant idea. Hope you are having a fab weekend and that the weather people are proved wrong. Waving back at you!! Over here! No - this way - a little more to your left - here I am - Hi! This bag is absolutely wonderful. So pretty! I love scrappy stuff - and this is really wonderful. I am inspired to try this raw edge/foundation scrap technique on something now - a throw pillow cover perhaps - though your bag is of course the ultimate! Wonderful stuff - thanks. perfection all over Lyn. Oilily should send you some of their fabric...do you hear us Oilily??? This woman does wonderful things with your yardage. Have a fantastic trip. I'm waving back! Oh my, so cute! You're brilliant!! I *love* the bag. It does go to show you that everything can have a use if you just figure out something as clever as that. Love the bag and love your writing! Wish I'd read this before today. I could have waved back Friday night! I absolutely LOVE your bag. I wish I had the energy to do something even half as wonderful. Oh and as far as the men/socks laundry thing goes it totally drives me crazy, I am always finding smelly socks around the house and he even piles his laundry next to the basket instead of in it - whats with that?! In fact on occasion I have put smelly socks in his laptop bag to find at work, as a hint! The bag is darling and so you! You have to have a sense of humor about men and their cluelessness. What woman--regardless of how messy--would consitantly throw the dirty clothes on the floor, right in front of the empty laundry basket, actually touching the side of the basket, but never even think to throw it IN the basket??? Really, you have to pity them. Lyn you kill me!!! I have to be careful when I read or coffee will come out my nose. This bag is so yummy! And re: men and laundry.... OY, don't get us started! Me? I refuse to turn smelly, sweaty, dirty socks inside-right. For almost 15 years I've been throwing them in the wash in disgusting balled up wads. They come out inside-out and that's how they stay. I do a lot of things for the men in my life, but sticking my hand inside dirty socks is NOT one of them. Plus I really enjoy watching him have to turn them right-side out in order to wear them every morning....lol. Hilarious post. Gorgeous Bag! That's what you get for having Mickey Mouse pants! fantastic bag and fantastic note! I have a house full of single socks. 3 boys, and 1000's of single socks. You have made me insanely jealous! I have bags and bags of these little tiny snippets. I haven't been able to part with them. I had intentions of making them into a quilt (okay, maybe 10 or 12 quilts). What a lovely, lovely bag. Thanks Lyn, every time I get a chance to visit your blog I get so inspired. You're always making the most wonderful things. The bag is so lovely. I love the colours, they are so bright and cheerful!! and your fabric stash!! I wouldn't be able to leave the house. and ahem,,,,, there was some mention of a raggy flower tutorial.....???? is this coming any time soon?? I have a little bag of scraps just waiting for the project..
i am on the most eastern edge on north america, you are on the westerly coast of britian. i could almost see you when i waved. your scrap bag is great,if i ever have the time i may make one for myself. need a new purse,i just end up stuffing all purse things into my bra. doesn't make for a hot set of tots. love your bag, you rocks!!! lovely bag. your pieces are so inspiring! my hubby does the laundry so I don't have that problem. oh I love your sense of humor and your bag too!! it's so pretty. My bf is able to do his own laundry so I guess I'm lucky! Been lurking for awhile, but MUST comment on the laundry situation. Tossing dirty clothes from the second story makes my family think they are helping in some way. Not so much. I love the idea of tossing the socks and undies...that would restore my mood as well. I must try that purse. Reading and loving it from Topeka, Kansas! I. Love. This. Bag. And yay for you for throwing the pantaloons out! It's called a laundry basket. How hard is that???? My husband likes to leave his on the floor DIRECTLY IN FRONT OF THE LAUNDRY BASKET. I haven't been ballsy enough to throw anything out YET. What a lovely bag! Nice colours an a smart way to make someting from all the stripes of fabric you collect over the years! That is so pretty -- now I feel justified in saving all my scraps! oh my. such a fabulous idea for all the scraps. just fab! Love scraps and the flower is FABULOUS! I've just discovered your blog after following a link from Posie Gets Cozy. I am really enjoying your posts and your photos-and I LOVE your whimsical banner! By the way, I have a messy hubby too, and I really like your method of tossing out the old socks and stuff! I cannot stop laughting about the socks and undies. My husband always leaves them on the bathroom floor. Drives me crazy! I absolutely LOVE that bag. Makes me think of all those scraps I had that ended up in the trash bin. I thought our apartment was just too small to store them. I'm kicking myself now. Ohh my goodness!!! This bag is sooo edible!! Sooo sweet!! Adore it!!! Lovely Lovely Lovely!! Thanks so much for the eye candy!!! I can't wait to see what you create next!! xoxo Jenny a new fan!! Did your husband ever find his pants?? I have so enjoyed your blog and just made some little brooches (putting your name on my blog as the inspiration, of course). thanks!